These cables are grey flexible rubber, the gray color being a little too modern for the look I'm looking for. 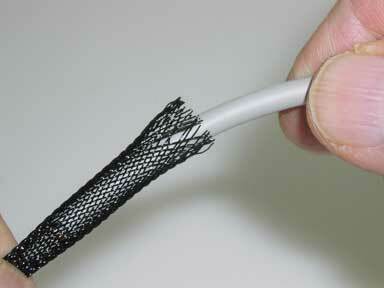 So I covered the cable with a black 3/8" fiberglass mesh before starting fabrication of the wand, see figure 21. 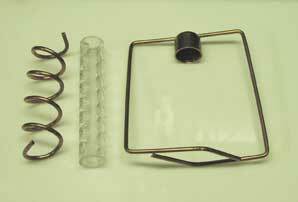 The wand components I used are a 4" plastic tube with the .5" inside and .75" outside diameter. I drilled decorative holes along the side of the tube. Just to add a little interest. Thin 1/8" diameter copper tubing that I bent and fabricated into different shapes. The copper fittings I used have an inside diameter of 3/4" that fits the 3/4" outside diameter of the plastic tube, see fig 22. The thin 1/8" copper tubing is easy to bend. I bent one length into a spiral, the other I fabricated to be like hand-hold handles for the wand and soldered it to the top cap.